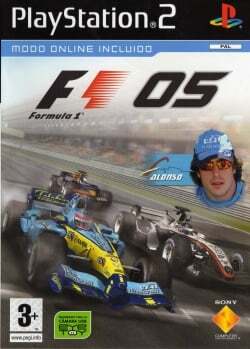 Game description: Driving fans will be able to explore new functions in the 2005 edition of the series, including interactive pit stops, a variety of new modes, and the opportunity to race in the cars that have made FORMULA ONE history. Challenge yourself with the improved career mode options offering more depth than ever before for wannabe racers, increasing the longevity of the game play with a greater variety of tests and opportunities. And go online for the ultimate head-to-head racing experience where you can battle against players from all over the world; prove yourself in the world ranking ladders where your best lap time and average speeds across circuits are judged against other drivers or join a 'buddy' list so can regularly take on head to head a group of players to become the ultimate champion. Players start out testing for a smaller teams (Minardi, Jordan and Red Bull Racing (Like in F1 04, a generic car does exist, but it is only used in Time Attack mode)). Players then work their way up the grid throughout their 'career' through a mixture of good tests and impressive race performances. As before, consistently poor performances will lead to dismissal from the player's current team. This page was last edited on 27 December 2018, at 17:43.